For most amateurs, plywood is the material of choice. Plywood is one of the cheapest and easiest building materials, one that the average do-it-yourselfer is both familiar and comfortable with. Plywood is also, pound for pound, stronger than steel. Because of its high strength to weight, plywood construction yields a boat that is much lighter and performs better than a “chopper gun” fiberglass boat. When used with the GLEN-L Epoxy Encapsulation System, plywood is as long lasting and as low in maintenance as any other material. No exotic tools are required, and with the possible exception of enough C-clamps, plywood boats can be built with the tools in the average home workshop. Plywood boats are frequently built in school wood shops or by youth groups as individual or group projects. To take full advantage of the material, our Plans and Patterns detail simplified construction methods geared to the abilities of the amateur. No difficult woodworking procedures, such as steam bending, are ever required, and the GLEN-L pattern system makes the difficult lofting procedure unnecessary. 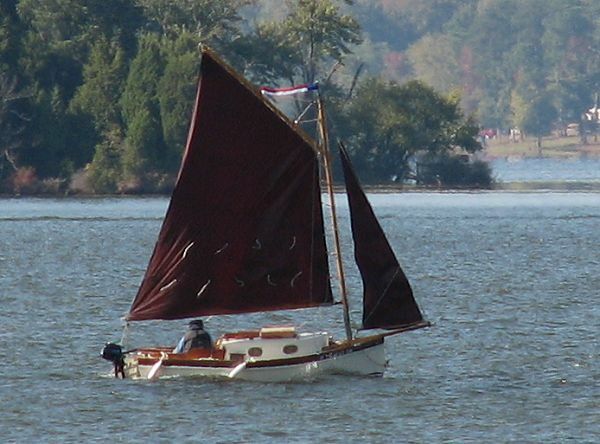 Plywood is used as a “sheet” material in the majority of plywood boats, including Stitch-N-Glue. Plywood is also used in “cold-molded” construction and “multi-diagonal” planking. On each design page the method is listed under “Hull” in Characteristics. This is the most common type of construction used by the home builder. Plywood is used in panels of one or two layers. This requires a minimum of cutting and fitting and requires much fewer frames than most “traditional” planking methods. For a look at the steps in plywood boatbuilding in more detail see our Sheet Plywood Pictorial Guide with captions. This method is utilized on round bilge hulls or hulls with compound shapes. The method involves cutting the plywood into strips (widths vary depending on curve), and laying up layers at angles to each other, glued and fastened. Epoxy is the recommended adhesive. Multi-diagonal Planking Pictorial Guide. 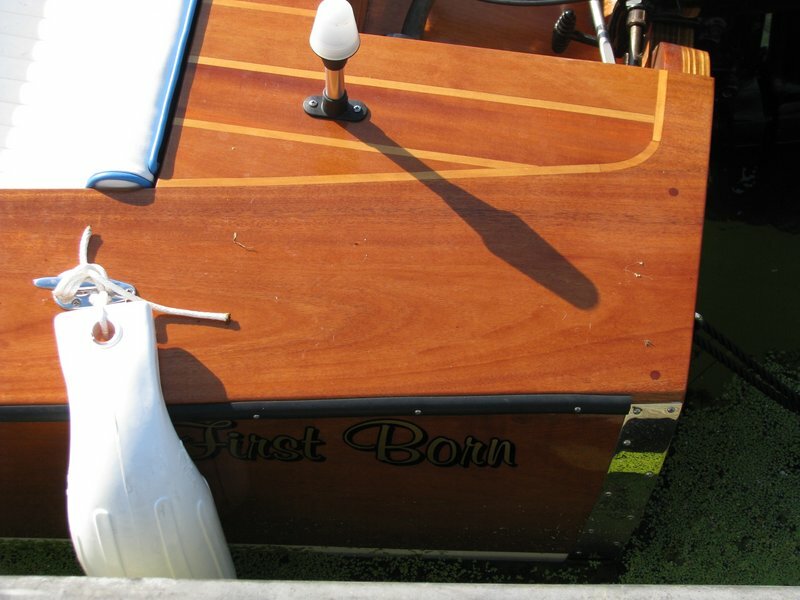 Certain questions about plywood and its use in boatbuilding crop up time and again. Usually these are based on a desire to get the most value for the least bucks, to save time and effort, and to assure a level of quality that’s acceptable to the builder. Note that I didn’t say that builders ALL want ultimate top quality, and that’s intended. 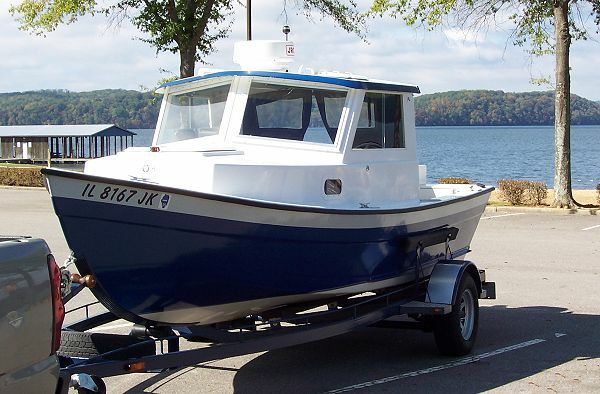 Just as in production boats, top quality is not always demanded, needed, nor expected. After all, not all boats need to last so long that they become exhibits in museums. Q: Must all plywood used for boatbuilding be waterproof? A: Basically there are three plywood grades; Interior, Exterior, and Marine. 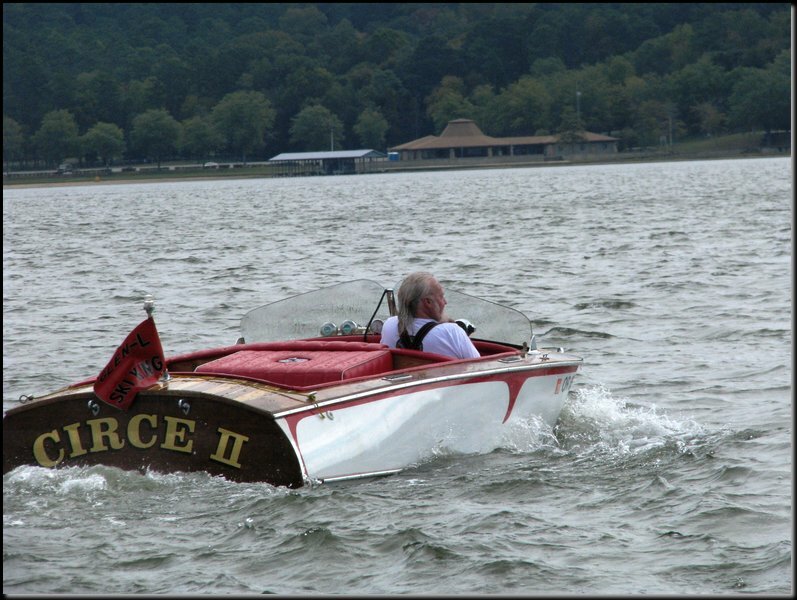 The typical assumption is that plywood used in boats must be made with waterproof glue. However, the accepted standard for such a glue is one whose bonds will survive a boil test. How many boats are ever subjected to boiling water conditions? None I know of. Fact is, for generations, countless plywood boats have been glued together successfully with low-cost powder-water mix plastic resin glue (a urea-formaldehyde product). And while highly water-resistant, this glue won’t survive a boil test and is thus not considered totally waterproof. But it will survive hundreds of consecutive cycles of immersion in water at room temperatures. The point is, Interior grade plywood is not rated for exterior or marine use where such panels may be exposed to moisture because grading standards permit non-waterproof glues in their manufacture. However, does this mean that such a panel might fail if exposed to exterior or marine conditions? Perhaps not if it is assembled with a highly water-resistant glue such as plastic resin. But one won’t know if such a glue has been used. Thus I ordinarily advise NEVER to use Interior plywood in a boat strictly because the standards permit use of a non-waterproof glue. Besides, the practice is penny-wise and pound-foolish. For structural members, stick to either Exterior or Marine panels. Q: When should I use Marine plywood? 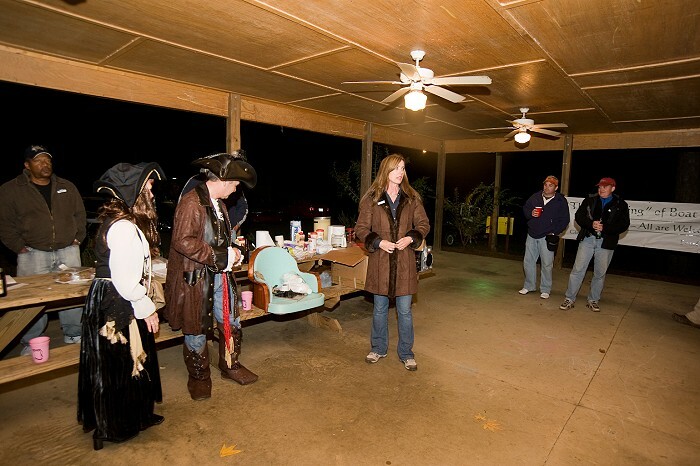 A: Some feel ONLY Marine plywood should be used for hull planking. But I think this is too rigid a rule. The important quality separating Marine grade from Exterior panels is the quality and soundness of the inner plies and their construction (both are made with waterproof glues as noted above). With the Marine panel, there should be no major voids or surface defects, and inner veneer joints (if they occur) should be tightly fitted. That said, using Marine plywood is most critical in my opinion where panels must conform to rather extreme curvatures (the bow in most boats, especially the bottom), and for boats built with “stitch-and-glue” methods. Another case where Marine plywood would be highly advised is on boats intended for high speeds and/or severe service. Here’s some reasoning. You might be able to save some bucks by using Exterior plywood for planking curved areas. And experience tells me that once such a panel has been bent into place, if it doesn’t fracture in the process, it will probably stay that way forever without incidence. But the problem with lower-quality panels is that you may not always see the voids. And if your panel does break while you are installing it due to hidden voids, you will have to replace it with another, thus making the cost about comparable to what you would have spent on the better Marine panel in the first place. And there’s no guarantee that the next panel won’t fail as well. As for “stitch-and-glue” construction, a void-free panel for planking is important so that the wire ties at joints don’t pull out under tension, which is likely to occur if stitching holes need to be located coincidentally with a void that suddenly crops up once the panel has been cut to shape. Such panels are also easier to work with for the same reasons when used for internal members and bulkheads on “stitch-and-glue” boats. Q: When can I get by with Exterior plywood? A: Other than as stated above, I’m not against using a good grade of Exterior plywood (for example, AB) for planking, and I’ve never heard of a boat falling apart because of it. You may have to make some repairs to the panel (e.g., fill voids) which can get tedious and is not always successful. But in flatter hull areas such panels will suffice for most boats. Exterior panels (with any major defects repaired when possible) can usually also be used for most internal members throughout a boat without problem for such items as transoms, gussets, bulkheads, etc. In fact, I’m not totally against using lesser-quality AC plywood for planking on certain boats. In case you don’t know, an AC panel can have open and exposed defects on the C-side. But since the boat will probably by sheathed with fiberglass, some builders use the C-side outside and fill all the defects with resin putty prior to fiberglass application; they become invisible once painted. On smaller, simpler, low-powered boats without a lot of curvature, I see nothing wrong with this practice, and again, have not heard of such a boat disintegrating over time because of it. Q: Why should I cover my plywood boat with fiberglass? A: We generally recommend covering all plywood boats with fiberglass no matter how small. While some complain of an increase in weight, this is seldom more than an ounce or two per square foot of area in the typical application. Then too, even lightweight coverings (say 4 ounce cloth) are better than nothing. When I speak of covering the outside of plywood boats with fiberglass, I use the term generically; you can use other fabrics such a Dynel or polypropylene, but fiberglass gives the best combination of price, ease of application, ready-availability, and protection in my opinion. Whichever fabric you select, the reasons for applying the covering are the same; added abrasion resistance, improved durability, extra reinforcing for finish coatings (especially at joints), reduced maintenance, better appearance, and to help insure against leaks. Thus sheathings should be considered as basically cosmetic coverings; their intent is NOT to add strength. In fact, plywood is far stiffer than fiberglass. Hull strength comes from the plywood hull structure itself, and with proper design and construction, should prove more than adequate. Glen-L carries epoxy, fiberglass cloth and application materials. 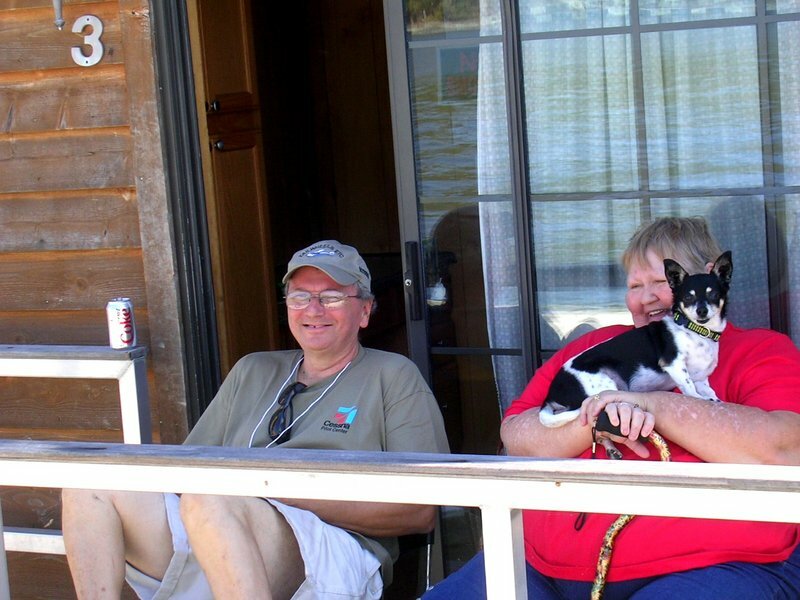 Q: What happens if I don’t sheathe my plywood boat with fiberglass? A: If it is made with Douglas fir ( a reasonably tough material), surface checking and wavy surfaces will soon occur even if painted. These will be very difficult to alleviate even if the boat gets painted each season. Other plywood types with a more uniform grain pattern will fare better in this regard, but these will still require routine coating applications. And because many species of plywood are not as tough as fir, they will more easily suffer damage without sheathing. If you absolutely insist on not sheathing your plywood boat, consider using medium-density overlay (MDO) panels. These still require routine coating, but the overlay prevents surface checking and presents a smooth paint-ready surface. These do cost more and may not be readily available, however. Q: Epoxy resins sound great but they cost too much. Can I use polyesters for sheathings instead? A: We quit offering polyester resins for sheathing application years ago simply because we no longer believed in them anymore for this purpose. Our feeling is that as long as you’re going to the trouble, you should use epoxy resins if at all possible; they’re worth the extra cost. The main reason is that they stick forever, and if you’re using as epoxy encapsulation system, (also highly advised), they are the only choice. That said, if you are on a budget, polyesters are acceptable if you do it right, but they don’t have true adhesive properties. Finish results with either otherwise appear the same, but polyesters are less flexible and resilient so tend to crack more easily over time. When this occurs, water can creep behind the sheathing and cause problems. As for the encapsulation process where all wood surfaces inside and out get coated, do NOT substitute polyesters this way in place of epoxies. Polyester resins simply don’t work the same; they don’t stick or apply well, and because of their lack of elasticity, crack easily which can promote rot due to entrapped moisture. See the epoxies available from Glen-L.
Q: Epoxy glues may be superior but I’m allergic to them – what’s next best for plywood boatbuilding? A: Because the stresses on a plywood boat are ultimately transferred to joints in the hull, a hard-setting glue (rather than a flexible mastic, for example) is required. As a result, glue choices are few. Prior to epoxies, the traditional stand-by’s were plastic resin and resorcinol. The latter is 100% waterproof while plastic resin is considered “highly water-resistant”. But as discussed above, plastic resin glues can work successfully in plywood boats for all practical purposes. Currently resorcinol costs more than epoxies, and offers no benefits over plastic resin glue in my opinion. Unlike epoxies, both need well-fitted joints, specific limited temperatures, heavy clamping pressure, and leave colored glue lines. Since plastic resin glues don’t stain and clean up easily, mix with water, and are a fraction of the cost of resorcinol, they’re my choice in lieu of epoxies. The only other alternative I’m aware of and have used with good results in the past is Aerolite, a water-resistant urea-formaldehyde based product by Ciba-Geigy sometimes imported from England but seldom found. This uses a powder-water mix along with a second liquid component, dries clear, and has some gap-filling properties. Once popular with kit airplane builders, it may still be available from suppliers in that field. Glen-L’s Poxy Grip is an excellent adhesive for your Glen-L boat. Q: Can I increase fiberglass thickness in order to get by with thinner plywood or compensate for lower quality plywood? A: I don’t know how this line of thinking evolved, but the question keeps coming up. Primarily it involves the fallacy that plywood is weaker than, and inferior to, fiberglass. Keep in mind that while fiberglass is strong in tensile strength, it is not very stiff. Conversely, plywood is actually stronger on a weight basis in both tension and compression. More to the point, the modulus of elasticity (stiffness) is actually much higher for plywood than fiberglass for the same thickness. Then too, for some reason many who ask this question think fiberglass is lighter and will thus save weight. This myth is quickly dispelled when a piece of each material gets thrown into a pond of water and the fiberglass sinks like a stone while the plywood floats. So the simple answer is that if you reduce plywood thickness and make up the difference with fiberglass laminate, you get not only a more flexible panel, but one that weighs a lot more. It will also add considerably to your cost and effort. And if this question is asked because thicker panels are not available, the answer is to use a double thickness of plywood rather than attempt to make up the difference with fiberglass. Q: Why is Marine plywood so expensive? A: As for domestic panels, my first reaction to this question is that we’re fortunate to have any Marine plywood available regardless of the price. Of the total amount of plywood produced in this country, less than 1/10 of 1 percent is Marine grade. Environmental and economic factors, coupled with very modest demand should warrant even higher prices in the eyes of producers. And if you consider the price of plywood compared to other materials, it’s actually a bargain. On a cost per square foot basis, many common materials are considerably more expensive than plywood, such as carpet and resilient floor coverings. And you can’t even build a boat from that stuff. While imported Marine plywood panels might cost twice as much as the domestic product or more (and we’re again fortunate to have this competition available regardless of the price), this is still a reasonable price compared to other alternatives. Compared to all the other boatbuilding materials an amateur may use, only steel is cheaper than sheet plywood. And when you consider the speed and ease with which a plywood boat can be built, it’s still the material of choice for most do-it-yourself builders. Q: Can I make frames out of plywood rather than solid lumber? A: This is generally poor practice in the framed plywood boat for several reasons. First, a main reason for using solid lumber for frames is that grain gets oriented in the direction we want for strength. If plywood is used for frame members instead, because of the alternating grain direction of the plies, there is no strength in those veneers in the cross-grain direction. In other words, a plywood frame will need to be nearly double the thickness to have the same strength (see Fig. 1 below). Second, longitudinal strength members (e.g., keels, chine logs, sheer clamps, stiffening battens, etc.) that intersect frames will require fastenings at contact points. If the frames are plywood, the edge grain of frames at such intersections will hold fastenings poorly, and if other than Marine panels are used, there is a possibility of voids at a point where they are least desirable. Third, attempting to bevel or fair such frames when necessary is difficult because of the alternating grain pattern at edges. The tendency is to splinter the frame edges instead. On the other hand, using plywood for joining sawn frame members via gussets, floor timbers, and the like is excellent because the alternating grain at such connections reduces splitting that would occur if solid wood members were used (see Fig. 2 below). 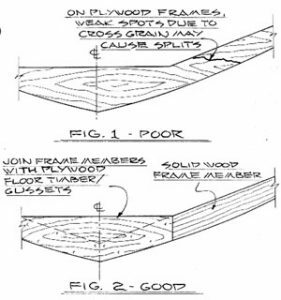 FIG 1 – Because of plywood’s cross grain, a plywood frame will be flimsy and not as strong as one from lumber of the same thickness. FIG 2 – However, because of plywood’s cross grain, using gussets, floor timbers, and similar members to join sawn wood frame members will largely prevent splitting at such connections. Q: If frames shouldn’t be made from plywood, what about stems? A: Actually stems from plywood, as long as they are thick enough (1-1/2″ is a nominal minimum) are preferable to solid lumber on the plywood boat. The reason is that a plywood stem is more dimensionally stable due to the cross grain. Such reduction in expansion and contraction reduces any tendency for movement or cracking along the centerline where planking halves join. 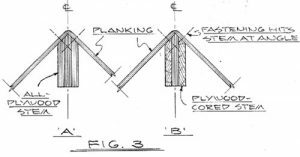 While it could be argued that the plywood stem presents edge grain for the planking fastenings, in reality the bevels required here allow fastenings to set diagonally to the grain for a solid grip if long enough (see Fig. 3A). An acceptable alternative is the stem made with a core of plywood and solid wood on both sides (see Fig. 3B). FIG 3 – A section through a plywood stem (A) shows that because of the bevels required, fastening into edge grain is largely avoided. An alternative is a stem with a plywood core and solid wood either side (B). Q: Why shouldn’t sheet plywood planking be fastened to transverse frames? A: The properly designed plywood planked hull incorporates as much as possible the principles of monocoque or “stress-skin” construction. Stitch-and-glue boats that depend upon glue bonded junctions reinforced with fiberglass tape often show pure adherence to such principles. However, not everyone is willing to trust their fate only to glue bonds; many still favor the extra security that fastenings and some internal framework can provide. After all, such construction has been proven strong and durable for generations whereas stitch-and-glue is still the new kid on the block. But even when transverse frames are part of the design, it’s the plywood skin that takes the stresses which are ultimately transferred to glued and/or fastened joints at panel edges. And if such panels are fastened across the grain to frames, localized stresses that can lead to failure of the panel can be generated. How so? Consider a plywood panel curved in place around a hull as being analogous to corrugated cardboard applied in similar fashion with the corrugations running lengthwise. We can pin or tack such a cardboard panel in place all around the edges to hold it in place. But what happens to the cardboard if we perforate it with a bunch of fastening holes crosswise? When bent in place, it would fold and break about the perforations. The same thing can happen in a sheet of plywood. Placing a row of fastenings across the plywood panels grain can weaken a panel and create a similar condition, especially so when the panel is also under tension due to bending. Conditions are exacerbated on the higher-speed powerboat where panel loads are greatly magnified due to slamming loads while planing. In short, while frames on the plywood boat may contact planking and be glued at such points, ordinarily such contact is not actually necessary and in fact, frames can usually be relieved from such contact without detriment. In reality, it’s the longitudinal members doing most of the work and this is why planking panels are preferably fastened only to these and at the ends of panels and NOT to frames between. 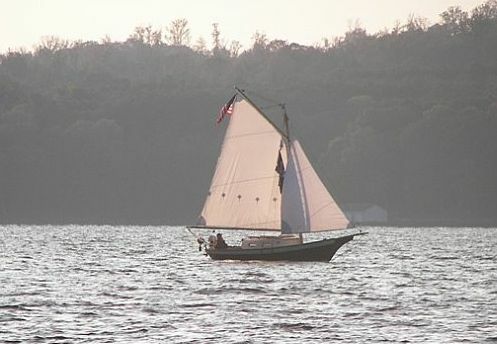 Q: What about using plywood for sailboat rudders, centerboards, and daggerboards? A: If a Marine grade panel is used, and these are thick enough (say 1″ or more), plywood is sometimes acceptable. However, I’ve seen many plywood rudders and daggerboards break in use, and again, the problem is that areas of cross grain within a panel tend to be weak and lead to fracture. Sailors often don’t realize just how much stress can be applied to a rudder turned hard over on the small sailboat or just how much force a capsized sailor exerts while standing on a daggerboard attempting to right the small dinghy. Another difficulty is that rudders and daggerboards should be faired to an airfoil sectional shape which is not as easy to do with plywood. 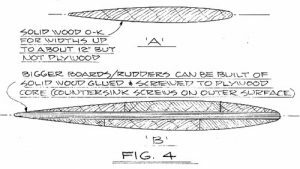 Thus solid wood is preferable, or you might use a rudder or daggerboard with a plywood core (1/2″ or thicker with solid lumber laminated to both sides (see Fig. 4A and 4B). Plywood boards and rudders should be encapsulated with epoxy and fiberglass cloth in any case. FIG 4 – A section through a sailboat rudder faired to an airfoil below water (A) is difficult to do with plywood; solid wood is preferable. However, one with a plywood core and solid wood each side is acceptable and perhaps preferable for larger rudders where solid wood will tend to split and/or must be glued up from narrower widths (B). Q: Can I use nails in place of screws for fastening plywood planking and decking? A: As a general rule on the framed plywood boat, because planking panels carry loads to the panel edges, screws give superior holding ability compared to nails, especially when panels are under the stress of bending. Nails in this situation lack the leverage inherent in screws to maintain this tension if a glue joint lets go for some reason (albeit a rare occurrence). Conversely, in flatter areas of a hull (especially on small boats or those not intended for high speed or rough water use), and at mid areas within a panel, nails are acceptable if long enough and of ample wire size. In most cases, deck panels can be nailed although I still prefer screws at panel edges in the case of powerboats since the deck is usually an important strength membrane. While nails may be relatively inexpensive, you should still pre-drill pilot holes for all but the smallest sizes. 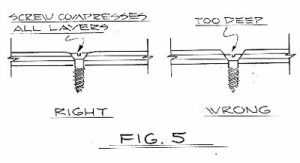 As for driving screws, do NOT countersink the heads below the outer veneers of the sheet of plywood; the screw should compress all veneers in the panel (see Fig. 5A and 5B). FIG 5 – The “right” way (A) and “wrong” way (B) to drive a screw used to fasten plywood planking. All veneers in the panel should be under compression. Glen-L carries silicon bronze nails and screws as well as stainless steel fastenings for above the waterline.